A blog tracking the frequency, causes and impact of TTC delays. Tess Kalinowski is the Toronto Star’s transportation reporter, covering one of the city’s busiest beats. She reports on TTC issues and management, as well as transportation issues for the GTA, Ontario and beyond. Her byline can be seen almost every day, and often more than once. I spoke with her for five minutes about the TTC’s challenges. What do you see as the TTC’s main challenges? A lot of people say funding’s the top issue, is it? I think funding is a big issue. Also, they failed to modernize. Their business practices and staffing are from the '70s or '80s. I think they’re addressing their problems, but there’s a way to go. Can you give an example of some outdated business practices? Well we had these people working in booths who were caught sleeping. Typically they had issues in other areas. People who were stressed or having a workplace problem were transferred to the most front-line job. Some people I’ve interviewed for this project say the TTC needs to have a more aggressive outreach campaign. What are you thoughts? For five years I have heard the TTC, city council and everyone complain that it’s underfunded. I’ve watched so many outreach campaigns. The funding situation has not gotten better year after year. They still don’t have the resources. The TTC is run by bureaucrats. There’s only so much they can push because their bosses are politicians. How much they can do is really limited. We have a big hole. For 20 to 30 years Toronto did not invest in transit — I don’t see it ever catching up. Does that depress you, as someone who’s covered the TTC for so long? As a reporter, problems are interesting. They add conflict and make you articles interesting. I have my own thoughts. I thought Gary Webster didn't need to be fired. I think bringing in Andy Byford from Sydney and London could make things interesting. But I don’t advocate an agenda. If I was a columnist like Chris Hume or Royson James, I could crusading for something. But my job is to observe and report. What to do about driver infractions? A similar case happened earlier this year in Toronto, concurrent with a case in Ottawa. What do you think should be done in cases like this? To what extent should drivers be penalized? Is it appropriate for these suspected infractions to be posted online? A fare collector made the front page of the Toronto Sun in 2010, months before he died of a stroke. I'd like to hear your thoughts below. Update: The driver in question has been called in by the TTC. As part of my project, I'm interviewing people with insights into issues around the TTC. One of the people I called up is a former city planners for Toronto. I wanted to get the perspective of someone who's witnessed city-building first-hand. Paul Bedford was chief city planner for the City of Toronto for eight years. A self-described passionate advocate for GTA transit and city-building, Bedford became a city planning professor at both the University of Toronto and Ryerson University after his 2004 retirement. He actively advises many city-planning organizations. What is main cause of TTC service interruptions? Lack of consistent funding. You get what you pay for. Almost all the funding now comes from our city, and it shows. Since amalgamation in 1998 we've had funding cut from the province. We need new revenue sources, whether it's from the public or private sphere. Taxpayers can’t make up for the lack of funding, and the TTC can't even keep up with the future of growth. We need light-rail and bus rapid-transit. What other TTC issues do you see? Maintenance is obviously a big one. It isn't clean. There’s broken escalators and poor service. There are times when my bus is half an hour late or more, and I’ve just walked. In September 2011 they reached their highest ridership. It’s grown a lot since amalgamation. We’ve been going downhill for a long time; it has to be turned around. We’ve got great transit for a city of 1 million, but we’re 3 million people! Why do you think funding hasn't been fixed then? The average person doesn’t understand governance at all. Because they have their own life to live. They need to have a better understanding of transit issues; how it affects us as a city and what we can do to fix this awful situation. What could the TTC be doing about this? The TTC should embark on a public awareness campaign. Same as GM did around the time of the bailout. They've posted a lot of ads lately about their funding shortfall. What do you think of this campaign? It's better than nothing. But they need to be in-your-face. It's a really hard fight for them. The platforms of Bloor-Yonge station are dangerously crowded. This past weekend, the Yonge line closed between Bloor and Union. The TTC gave sufficient warning and operated frequent shuttle buses. It was inconvenient, but well-executed. Most people knew about it, and were only burdened with a few extra minutes on their commute. The weather was nice, to boot. The line was closed as part of a tunnel upgrade, explained by The Grid. It's to deal with the tunnels' inevitable decay over time, and will help weather-proof sections of the line. It's the reason for last month's late-night closures of the route's north section. There's no such thing as a perfect time to close the line, which faces an unsustainable amount of commuters, and is likely the TTC's busiest route. "Rescue" trains are often dispatched, rolling right into Bloor-Yonge station empty to help soak up some of the platform crowding. It's amazing how quickly the platform clogs up, and it's one of the main reasons for the relief line project. In today's class, we made Vuvox presentations. A Vuvox is sort of like the ultimate slideshow. You cna throw in pictures, text, audio and even videos. It's really easy to use, and you can add crazy angles to your stuff. I took my Flickr pictures and some audio I recorded for my previous videos. I tried to embed previous YouTube videos, but it wouldn't work. A look at the TTC. I wasn't a fan of Vuvox. To be frank, it has a clunky layout, a lack of customization and no ability to save before finishing. The images you upload turn out pixelized. While there's value to a free, easy-to-use video editing program what's web-based, I'd rather spend the time learning much more complicated programs that give you quality results, like Final Cut Pro or Adobe Premiere. This week we're studying online infographics, and how news sites can convey data through both interactive and static images. The most recent operating statistics I could find is from 2010. Some of their layoffs last fall included communications jobs, which probably plays into this. It was easier than I thought to make these, though these programs does much of the processing work. It's easy to see why data visualization is becoming so popular, as it's no longer statisticians who can observe trends and suggest improvements to our public systems. is covertly photographed for the whole world to see. Earlier this month, the online magazine Toronto Standard interviewed the founder of the Toronto Etiquette Project. The guerilla group acts as a manner police, issuing printed chits to classically rude Torontonians for infractions like eating on the subway and being loud on the phone. They're not the only group to issue a list of somewhat obvious tenants for a more polite transit experience. The Standard post mentioned cities that issue fines or kick people off the system for eating. Some argue that it's part of being clean and avoiding unpleasant odours, while others feel it's a human right. While I'm too self-conscious to eat on the TTC, I think it should be allowed for non-sloppy, non-stinky food. Commuters spend an awful amount of dead time on a subway system that is still has no mobile reception. Yesterday, the blog posted an update, complete with a video and footage of some unfortunate schmoes eating their lunch. What are your thoughts on dining on the Rocket? Every Torontonian has TTC delay horror stories. As City Hall raises fares and cuts service, commuter headaches are bound to get worse. TTC Headaches will take a look at the frequency, causes and impact of Toronto’s multiple transit headaches. We'll map out delays, find out which routes are the worst to take and rank causes of delays. This blog is not affiliated with the Toronto Transit Commission. This blog is a multi-platform course project by Dylan C. Robertson, a University of Toronto-Centennial College journalism student. A fan-run site all about the TTC, GO and other transit networks. Includes current news and historical photos. 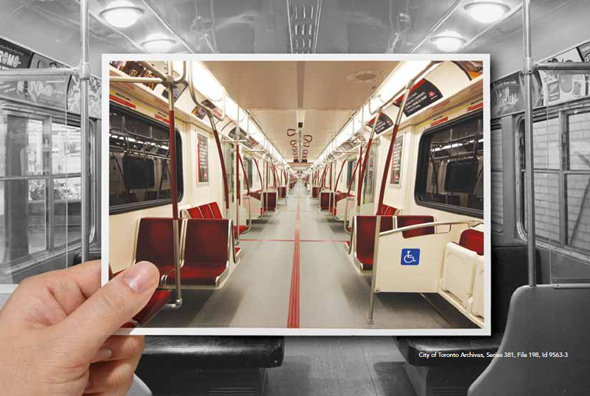 An advocacy group monitoring TTC management that plans petitions and supports activists. A transit blogger and columnist with many well-researched thoughts on the TTC. A frequent source for city journalists. Official website of the union for TTC and York transit employees, Local 113 of the Amalgamated Transit Union. An independent citizen panel that proposes changes to the TTC. Their report led to hiring a customer service officer. Chris Upfold frequently responds to rider's questions and complaints. This amusing site tracks all the ways you can make your TTC ride more efficient, from where to sit on the subway to which subway entrance is the least crowded. A must-read for lifehackers. A new blog launched by two Torontonians. They’ve published a financial analysis that focuses heavily on employee compensation. A 2010 project that seems to have slipped through the cracks. I’m checking in on the status. An aggregator of TTC news. How can we reduce the number of delays?